Regularly practicing gratitude can make our lives better. By the time you read this, most of us have already sat around the table, stuffed our bellies with turkey, mashed potatoes, cranberry jelly, green bean casserole and pumpkin pie. We probably said thanks and smiled at our loved ones across our meals, remembering for a split second just how lucky we were to be there. The true challenge is to extend that gratitude past our annual fourth Thursday of November in order to make it really stick. I’m not gonna lie: In a world where we thrive as individuals — often forgetting community — it’s difficult to maintain that same Thanksgiving gratitude. Last year, the average American sat on his or her phone for approximately four hours a day, living in an insular world, away from real interaction. We can send emails without hearing one another’s voices, espouse opinions without actually giving our names, and buy everything online, from toilet cleaner to toilet paper to the actual toilets themselves. Everything is fast: I want, therefore I get, within two days, thanks to Amazon Prime. Thanks to today’s quick deliveries, it’s easy to simply ask, receive and move on. In the early 2000s, the concept of “slow food” became popular. The idea of returning to traditional cooking appealed to a public that had begun accepting “slow food” as merely meaning “the restaurant took half an hour to give me my order.” That slow food crusade produced organizations all over the world that now promote slow food in our homes and restaurants. So I’d like to propose a new movement of sorts: A return to “slow life,” at least one day a week. On a weekly basis, try asking yourself how you contribute to the community and whether there’s something small you could do. While you’re at it, sit down for 15 minutes with a cup of coffee, tea or cocoa, and think of everyone in your life who has been kind to you. How can you return that kindness? That’s the thing about true gratitude. It inspires us to be better. 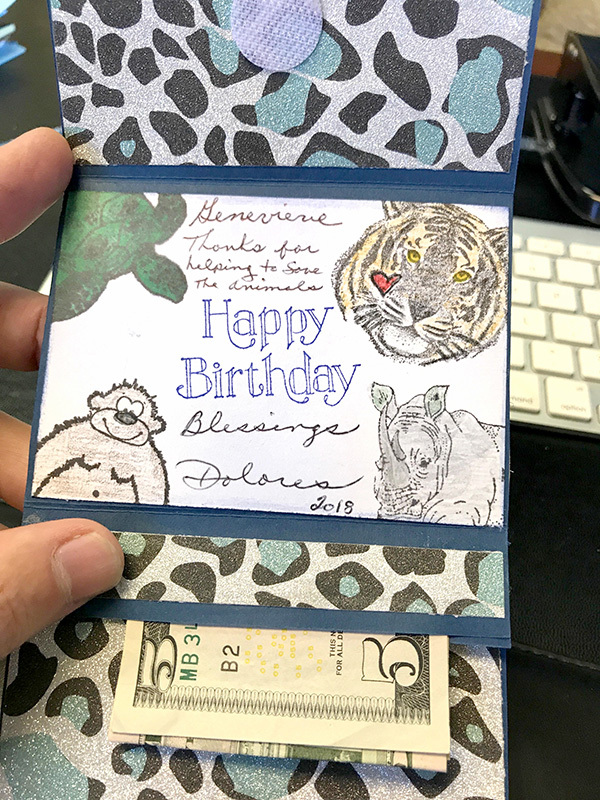 Not only did she contribute to my cause, but Dolores took time to create a card, complete with pictures of wildlife, and drop it off at my office. My partner, Erik, was floored. He couldn’t believe someone would take the time to make a card and then deliver it in person. The money was nice, but the gesture was priceless. So, thank you, Dolores. And thank you to my dear readers for taking the time to read my column. With all of the tragic news around us, particularly the California wildfires, we really do need to slow down, acknowledge those in our circles, and find appreciation in all facets of our lives.